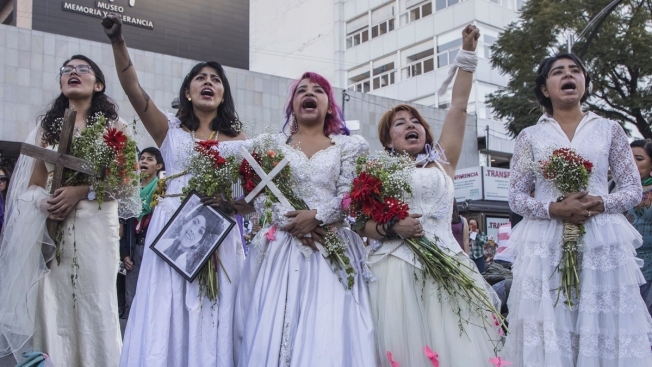 Women dressed as brides attend a march marking the International Day for the elimination of violence against women in Mexico City, Sunday, Nov. 25, 2018. The United Nations' Office on Drugs and Crime says about 50,000 women around the world were killed last year by their "intimate partner" or a member of their family, NBC News reported. That means nearly six women were killed every hour, according to the UNODC report released Sunday, the U.N.'s International Day for the Elimination of Violence Against Women. Partners or family members were responsible for more than half of all the killings of women in 2017. The findings didn't surprise Rachel Goldsmith, an official at U.S. victim's assistance organization Safe Horzion. She pointed to last week's shooting at a hospital in Chicago, in which a man fatally shot his former fiancee and two bystanders. "This is happening all across the country where women who have made the decision to leave a relationship and their partners have decided to respond with firearms or violence," she said. Multiple people were shot, including a police officer and a potential suspect, after at least one gunman opened fire at Mercy Hospital on Chicago's South Side, police said.